class="post-template-default single single-post postid-338786 single-format-standard custom-background group-blog header-image full-width singular wpb-js-composer js-comp-ver-5.7 vc_responsive"
Lincoln, Neb. — The public will continue to have access to Nebraska’s largest waterfall for at least another 25 years. 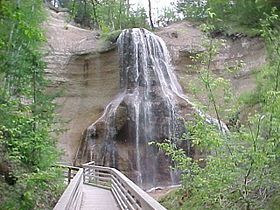 The Omaha World-Herald reports that the state recently signed a new lease agreement for Smith Falls State Park, which is mostly on private land along the scenic Niobrara River. Terms of the new lease weren’t disclosed. The original agreement had been set to expire in 2020. Nebraska Game and Parks Commission Director Jim Douglas says Smith Falls is a special place in the state, so he’s glad public access has been preserved. Douglas says the commission may consider making improvements to the park now that this long-term lease has been secured.